When you sign up for any BOM program, the entire year’s worth of patterns, fabric and/or supply purchases by our shop is allocated to you. That means we have already incurred the expense. There are no cancellations! Your card on file will be charged each month. All members are expected to review their packets each month to be sure they have received everything they should have. We do sometimes make an error in cutting, and while we will make every effort to correct the mistake, we cannot promise to have the exact same fabric months after the fact. Please review your packet BEFORE the next pickup or shipment to let us know if a mistake was made. If your notification occurs after that, we cannot guarantee an exact replacement will be available. If we become aware of an error that has occurred in everyone's packets, we will mail out corrections or replacements immediately. For in store customers, packets will be available for in store pickup at the first of the month. For online customers, a $7 shipping charge will be added to each payment. Packets will be shipped Priority Mail through USPS and mailed the first week of the month. 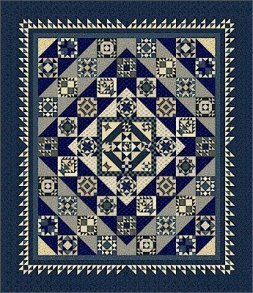 Indigo blue and light quilts were so very popular in the 19th century and are still a classic today! 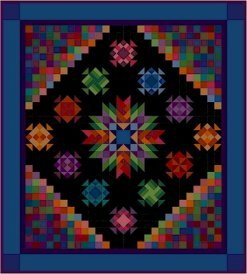 The quilt features several gorgeous Indigo blue prints, as well as many other shades of blue, and a blend of lovely light prints that make the 12-month program. Quilt size 77" x 89"
Another beautiful design from Nancy Rink. Vibrant colors that are put together in such a striking design. This 12- month BOM is one you don't want to miss. Quilt size 88" x 98"
Join us for the rich tones of Mineral Matrix in the gorgeous BOM! The Tonga Quarry Collection offers a beautiful decorative palette of soft grays and mocha that shade into cool steel blues and rich warm browns, with a touch of dusty aqua. You will receive a complete instruction book with instructions. Each month you will receive fabric to make one block. Please see our general BOM information (above) to learn more about how BOM works. This program will begin on May 1 and go for 12 months, but you can start anytime! Finished size is approximately 104" x 104".